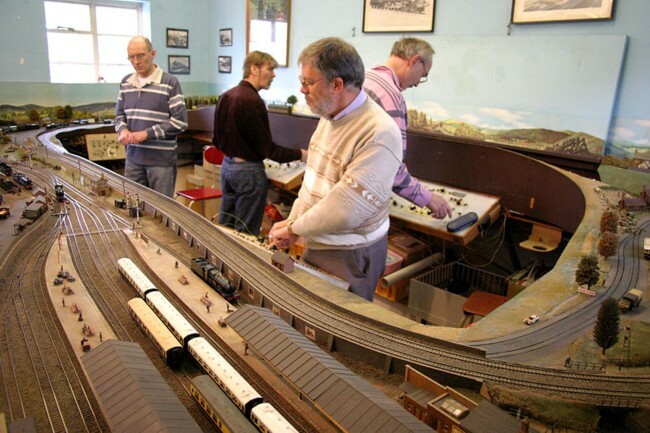 The permanent layout in the clubhouse is based on an extinct section of the Great Western Railway running through Cheltenham. The major part of the model is taken up by a representation of the central town terminus at St James' and its goods yard. Also modelled is the connecting line from St James' to Malvern Road, where a junction is made with the main line between Gloucester and Stratford-upon-Avon, part of which is also seen. The layout is designed for continuous sequence and timetable running of the rolling stock and the section owns sufficient locomotives, passenger and freight rolling stock to enable representative services to be run. However members own stock often make appearances at open and public running days. As well as operating and maintaining the Cheltenham Spa St James the 4mm Group has started work on a new portable layout. This new layout is based on Keswick in the Lake District on the former Cockermouth, Keswick and Penrith Railway which was operated by the LNWR (LMS); the NER (LNER) had running powers. The layout will be some 28 feet in length with seven sections. The baseboards are complete and the group is now making progress with the track work prior to installation of the electrics. We intend to model all the track work, buildings etc. with only a few minor changes to fit the space we have at our disposal. We meet every Thursday from 8pm in the Clubhouse and we would welcome new members to help build Keswick so why not pop in one Thursday evening and see how much fun YOU could have with Keswick. We shall be more than delighted to see you.